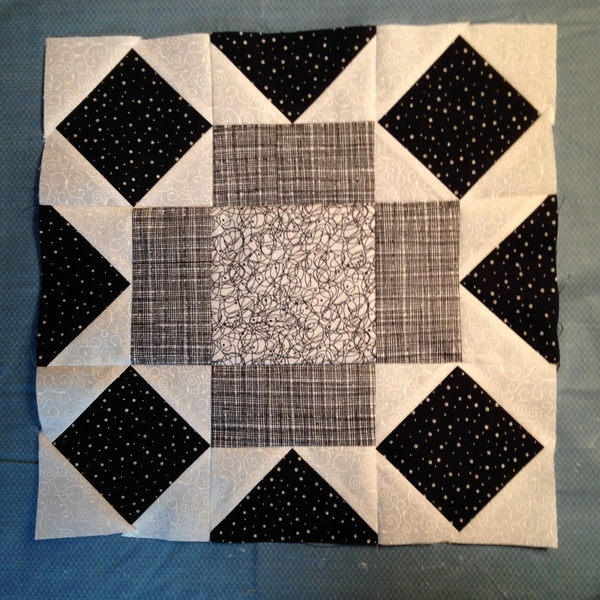 Each month, for all of 2014, I’ve been making a black and white block of the month. Yesterday, I picked out the fabrics for the December block, cut it out and spent two hours sewing it together. I can piece blocks and they usually come out pretty close to what they’re supposed to be, but this one confounded me. I sewed, ripped, then sewed some more and then dropped it in the garbage. I know when not to put more time into a bad outcome. So, after dinner, I dug out my “block book” and picked out a different one to use as block 12. I used the same fabrics and I’m happy with this one AND it certainly didn’t take two hours!